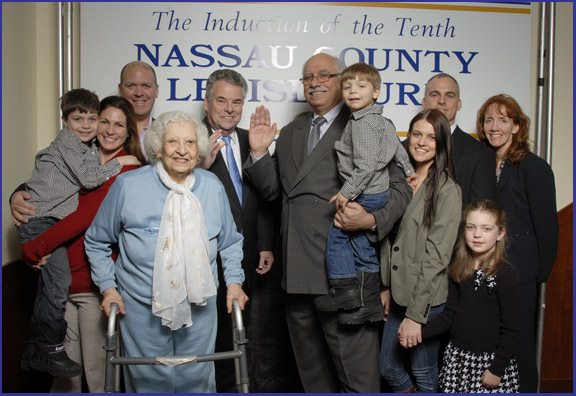 On January 6th, Legislator Dennis Dunne, Sr. had the honor of being sworn into his tenth term at the Nassau County Legislature by the Honorable Joseph N. Mondello, Chairman of the Nassau County Republican Committee. Legislator Dunne represents Legislative District 15 which includes Bethpage, East Meadow, Levittown, Seaford, Wantagh, and Westbury. At the legislative meeting on the same day, Legislator Dunne was also elected to hold positions on five legislative committees. He is the Chair of the Public Safety Committee, Vice Chair of the Planning, Development & The Environment Committee, Vice Chair of the Veterans & Senior Affairs Committee, a member of the Minority Affairs Committee and a member of the Rules Committee. Legislator Dunne is proud of his record of fiscal conservatism and constituent service. His goals for this term include completing the steps necessary to fix the county tax assessment system, stopping the county’s reliance on borrowing, and making government more accessible. He will also continue to hold the line on property taxes. Legislative District 15 has changed to include new communities which Legislator Dunne looks forward to representing in his new term.